The idiom “A Picture Is Worth A 1,000 Words” popped into my mind when I first saw the photo taken of me at about 2km from the finishing line of X2 Race. The photographer (Hila Tibi) had captured my innermost thoughts at that very moment when I lifted up my head, and saw that I still had another peak to surmount. It was the last climb of the 18km, 1,800m/D+ X2 Race. After reaching the peak, I could then let the gravity help me descend the steep, rocky downhill to the finishing line that was 2km away…so near yet so far. What the f***! Another climb? Where is the finishing line? Have they moved the finishing line? I am never going to sign up for races again! It’s weird. The X2 Race (shorter version of the 45km 2×2 Race) is an out-and-back route. I was on the way back to the starting line. The exact route but different direction that I ran on 5 hours ago. As such, I should have known another upcoming climb before finishing. Yet, I conveniently forgot that I had to climb the same hill that I had descended earlier. Perhaps it was just selective amnesia so that I could push the horrible reality of climbing 130m of technical terrain to the back of my mind. A 130m climb usually poses not much of an issue to me. However, at that moment, I was looking at the 130m climb through the eyes of a person whose legs had already been thrashed by 5 hours of ups and downs. Thus, the molehill must have metamorphosed into a mountain at that point in time. Silviu and I were not planning to participate in any races in our month of summer holidays in Romania. We had decided to cancel our 50km OCC (a UTMB race) registration due to the expected exorbitant accommodation expenses that we would incur in Chamonix. I was expecting a race-free holiday in Romania, and was thus not physically and mentally prepared for racing. Just a week before the X2 Race, one of our friends mentioned that the 3rd edition of 2×2 Race would be held on the last weekend of our stay in Romania. 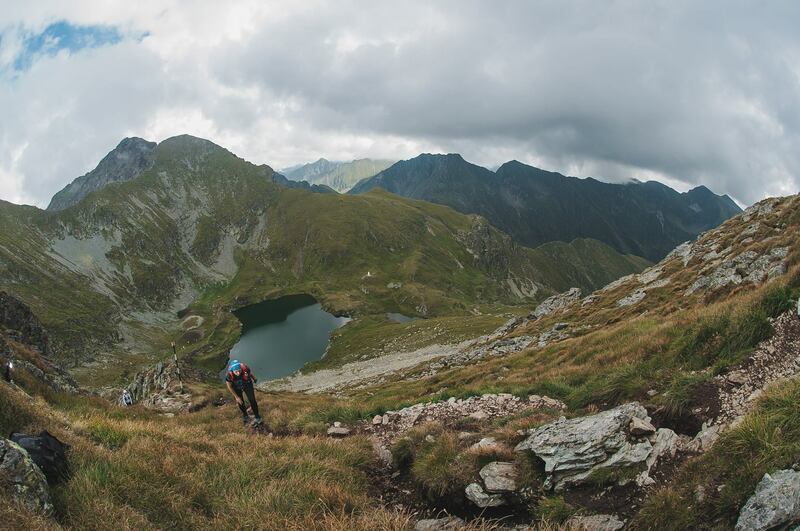 The 2×2 Race (www.2x2race.com) comprises the longer race of 45km/4,200m/D+ (2×2) and the 18km/1,800m/D+ (x2) set in the Fagaras Mountains, in the Southern Carpathians range. Silviu was very keen to participate in a race in his hometown. I was both exhilarated and scared at the same time. 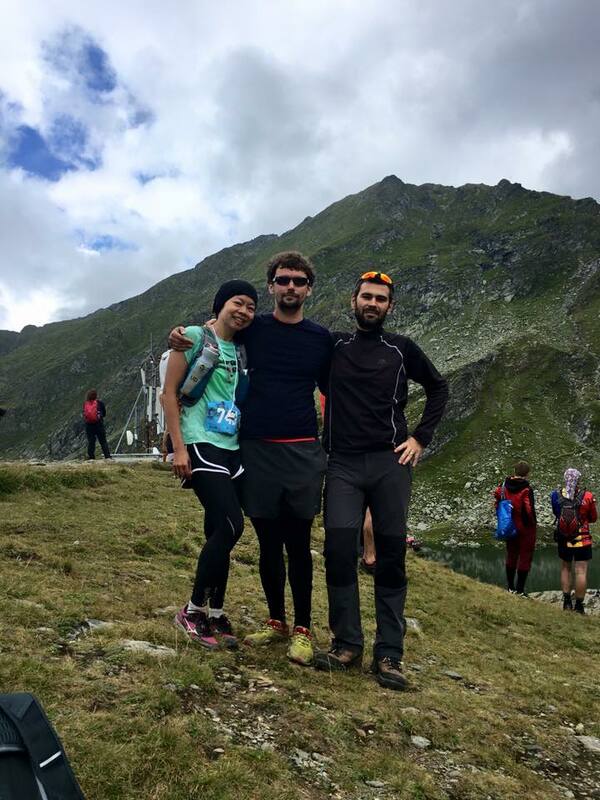 It would be my first sky running event and having been on the Fagaras Mountains, I knew how technical the terrain was, and there would be several sections whereby I had to cross by searching for crevices on borders so that I could place my foothold. And if it rained, running on the slippery rocks is no laughing matter. The more interesting feature of the event is that it is considered a sky running event: 2×2 and x2 would take place on an altitude of more than 2,000m for the entire event. The longer race will cover Romania’s highest 2 peaks (Moldoveanu (2,544m) and Negoiu (2,535m)) while the shorter race will cover only the latter. Another challenging feature of the race was that there was hardly any flat ground where one could recover before tackling the next climb! We did a 5km reconnaissance of the race route just a few days before the race. Based on the reconnaissance time, I estimated that it would take me 7h to finish the race, with 3 hours buffer from the 10h cut-off time. With the surge of adrenaline during the race, I managed to finish in less than 6h, with a few minutes to spare. I told Silviu that I would only do the race if we did it together. I was afraid that I would get lost since I was not familiar with the route. Moreover, being a small race (about 200 people for X2 Race), there might be sections where I would be all alone. For the first half of the race, Silviu and I were within the sight of each other. We were a few minutes from each other. Silviu got to the Peak Negoiu first, a few minutes before me. When I finally reached the peak, I was extremely excited. It took me about 2h 53min, much shorter than the 4h that I anticipated. Since the return trip would be easier with less elevation gain, I was thinking I might be able to finish the race in 5h 30min. I did not manage my nutrition well on the return trip. At one point, I could hardly move faster than a walking pace. Energy just seemed to drain from my body. I felt no aches or pains in my body, but my legs just refused to move. Up to that stage, I had only consumed an energy gel, some energy drink and a slice of orange. I tried to force myself to eat a piece of chocolate to get some sugar, but my mouth was so dry that I had a difficult time swallowing the chocolate. At that point, Silviu was already quite far ahead. He had been waiting for me at different junctions in the last few kilometres. After 4.5h into the race (13km), I told Silviu to proceed and not to wait for me. Silviu could aim to finish in less than 5h 30min without waiting for me. I hoped for a finishing time of 6h. I felt less stressed without Silviu having had to wait for me. Soon after, I reached the last checkpoint where the coca cola served was my saviour. Gulping down a cup of the bubbly sugary drink, energy surged through my body. My walking pace turned into a hiking pace. I continued to push ahead, occasionally attempting a slow jog (more like shuffling). My finishing time was revised to less than 6h. After close to 6h of Ups and Downs. With Florin, the friend who told us about the race and who kindly drove us to the race, and waited for us to finish it. I reached the last peak in 5h 12min, with a 1.4km to go to the finishing line. However, it was not a straightforward finish. It was a descent of 360m in less than 1.4km on rocky switchbacks. I tried to overcome my fear of slipping on the rocks, and descended with the help of my hiking poles. I also had to manoeuvre my descent around the increasing number of midday hikers on the trails. The finishing line welcomed me after 5h 52min, just before 1pm.